The American Singer show cage is descended from the old metal "shelf cage" that was common in pet shops years ago. This cage was 11 inches wide, 7 inches deep, 10 inches high. The right side is solid metal, the top and other sides are wire. Some older cages have the solid side on the left, these are allowed. Today, new cages are manufactured to the same dimensions by Prevue Hendryx and Jovaco Inc.
Click Here for more information about the Jovaco cage. American Singers Club members can purchase cages directly from Prevue Hendryx for $47.22 each, does not include cups. These cages cannot be ordered online, you must phone (800) 243-3624 to order. Ask for model "CSC". The new Prevue are solid on both sides. You can buy plastic bullet waterer (model 1202W) and plastic bullet feeder (model 1202F), which are allowed in the shows. 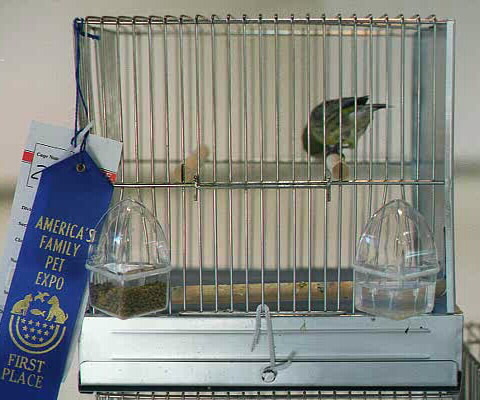 However, most exhibitors spread the cage bars and insert hooded glass or plastic cups. Glass cups are no longer made, but can sometimes be found in antique shops or from retired bird breeders. Plastic cups are available as clear (as shown in the above photo) or frosted. You can use glass, plastic or bullet cups in the show as long as both cups match. New, clear plastic cups can be ordered from Canada, Click Here for more info. Plain, white paper must be used to line the bottom tray. Unlike colorbred and type canary showcages, seed is not dumped on the bottom. 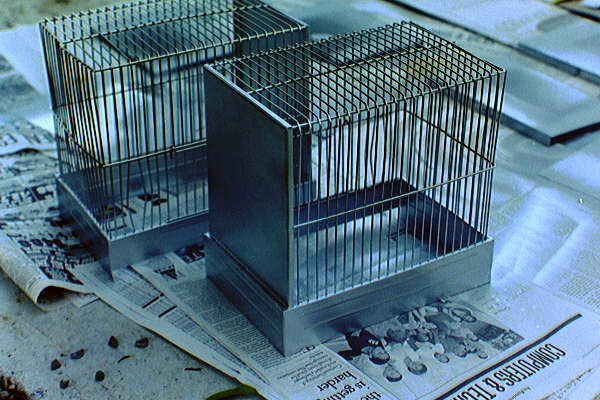 Click Here for an article about show cage preparation. If your show cages is too shiny, the bird might sing to his reflection in the solid side. Before using, they should be spray painted a dull silver color. An extra coat of silver paint inside the cage base and on both sides of the bottom metal sheet (which goes under the cage tray) will help prevent rust. It is no longer required that the front of the bottom tray be painted silver, but you will not be penalized if you do. Be sure to use non-toxic, lead-free paint. Allow paint to dry and the cages to air out at least one week before putting a bird in. Buff off any dry paint powder with a rag before using.